We went from the Haverthwaite station which as off the A590 near the junction of the B5278 (which goes to Flookburgh and the Haven Lakeside Caravan park and Grange-over-sands) near the bottom end of Lake Windermere. The station has an engine shed with a number of working engines, and some under repair / restoration. 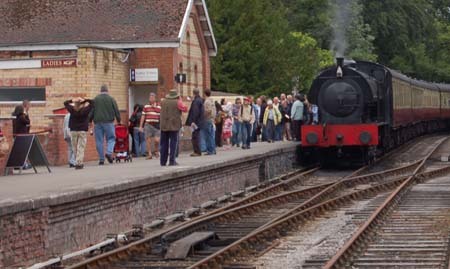 You are able to go into the engine shed whether you have purchased a ticket for the train or not. 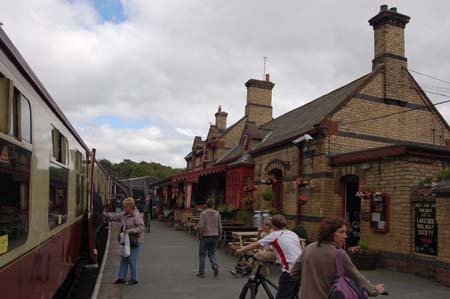 The station has toilets and baby changing, as well as a cafe and shop. We didn’t try the cafe, although it looked good food and reasonably priced. I’m sure it would have been much better than the food we did buy – see down. We boarded the next train and went to the Lakeside station at the end of the line. It was only a fairly short journey. It was just long enough to be enjoyable and not so long that our young daughter got bored, so that worked out well. At the Lakeside station there are boat trips running, and it is popular for people to use the train as one leg of a longer journey across Windermere to Bowness and optionally on to Ambleside. 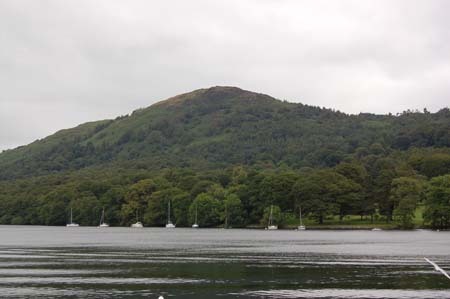 From there you can visit Bowness, quite a nice small town and the Beatrix Potter (Peter Rabbit) exhibition (see The World of Beatrix Potter – Tourist attraction for young visitors to the Lake District), Windermere, and Ambleside (one of the larger towns in the Lake District). For those not wanting to go on one of the boats then Lakeside is also home to the Aquarium of the Lakes, you can have a meal in the cafe (although I wouldn’t recommend it) or just enjoy the scenery of Lake Windermere before the return journey. We didn’t visit the aquarium of the lakes this visit, although I have been in the past. Effectively it is like a sea life centre, but more focused on fresh water fish that live in the lake but also covering fish that can be encountered off the local coast. We did however go to eat at the Cafe at the Quay. The cafe is reached by climbing a large flight of stairs. There is a coffee shop downstairs, but that doesn’t really have much in the way of food. There are some high chairs in the cafe and they can warm bottles, but it is badly let down with the choice of food for children. I asked about children’s choices and they quite frankly didn’t have any. They could have a jacket potato, but it was at the full adult price of about £5, which for a young child was incredibly expensive. There were no children’s sandwiches, although there were sandwiches and paninis for adults. The problem is that these were expensive for children and the type of filling was completely unsuitable, there were no just ham or cheese sandwiches which a child would eat. In the end we paid the adult price for a jacket potato and ended up sharing it with our daughter. I was very surprised as there must be lots of children visiting the aquarium and the railway, the least they could have done is sell some food that was suitable. If you are eating with a young child then I suggest you give this cafe a miss. We then bought an ice cream from outside (not wanting to waste even more money in the cafe) and returned on the next train. The railway is well worth a visit, but I wouldn’t plan to eat at the cafe by the quay. The cafe at Haverthwaite Railway Station looked to be much more suitable. This entry was posted on Wednesday, September 5th, 2007 and is filed under Babies, Children, Holiday, Tourism. You can follow any responses to this entry through the RSS 2.0 feed. Both comments and pings are currently closed.